A man checks his Facebook page on his smartphone in a metro station in Washington, DC on May 9, 2012. 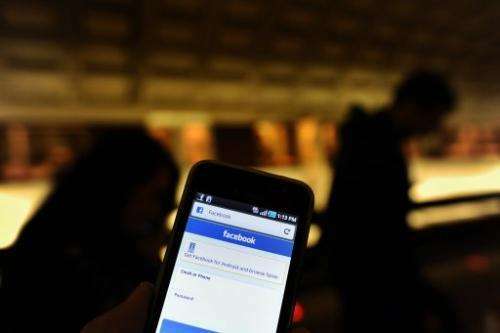 A Pew Research Center report indicated that online social networks have become political hotspots in the United States. Approximately 39 percent of US adults engaged in political activity in Internet communities during the 2012 US presidential campaign, according to a Pew report titled Civic Engagement in the Digital Age released late Wednesday. By comparison, only 26 percent of people in the United States used online social networks in any form or fashion during the prior presidential election in 2008, Pew reported. "The typical American who is politically active engages with political content across a range of venues—online, offline, and in social networking spaces," said Pew Internet Project researcher Aaron Smith, author of the report. "Social networking sites offer a space for individuals who are passionate about issues to share that passion with others, and their engagement with those issues often bleeds over into other aspects of their lives." Findings based on a phone survey during a three-week period in 2012 showed that 43 percent of US adults were inspired to learn more about an issue based on information gleaned from a social network while 18 percent were impelled to take action. People doing well financially or with college educations were more likely than those who were poorer or less educated to be civically or politically active online or offline, according to the study. "Despite hopes that the Internet could change the fundamental nature of political participation, it is still the case that the well-educated and relatively well-off are more likely to take part in civic life," said Smith. Despite online social networks serving as forums for politics, most of everyday discussions and campaign contributions take place offline, according to the Pew report.